Patience and perseverance: not easy virtues, especially in today’s “modern society” of instant results and gratifications, and throwaway consumerism. Two years ago, I received an orchid as a hostess gift. It brought beauty and joy to my home. Then the flowers fell off and the stems dried out. It still had big green leaves. Usually I would have thrown it out once the flowers were gone but for some reason unknown even to myself, I kept it and continued to give it its three ice cubes every Wednesday. It went dormant. Nothing seemed to be going on but every Wednesday, the orchid got its three ice cubes. Eventually a new leaf started to grow. 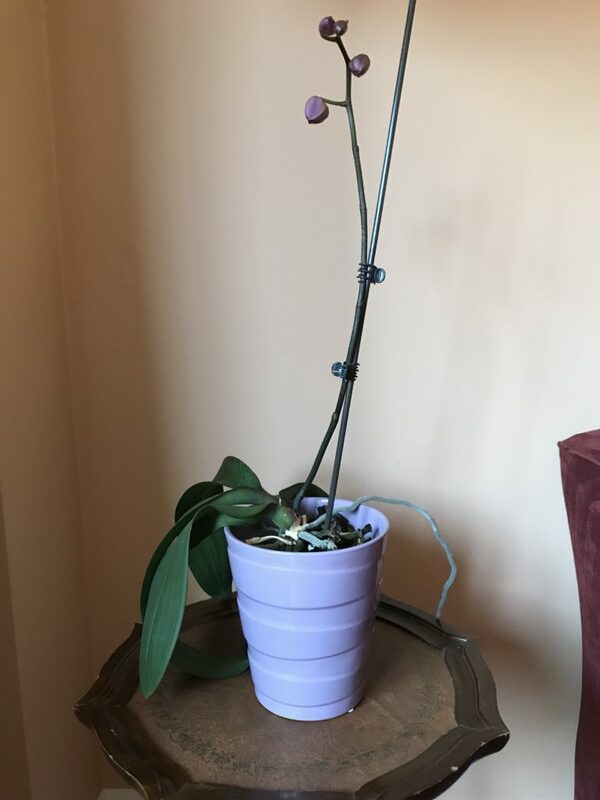 I realized that my orchid still had some potential for regrowth. I started to have more faith in it so I continued with the three ice cubes. Well, 2 years later, a new stem has grown with four flower buds on it. How exciting! And what a great lesson for life! Don’t give up. Your health is like that orchid. You need to persevere and be patient to achieve the desired outcomes. Nourish yourself consistently. By making the right diet and lifestyle changes, you will eventually see improvements and results. Be gentle with yourself. You may have setbacks; you may slip up and forget your “ice cubes”. In the scope of things, it doesn’t matter, as you will have started moving up the slope of health. Don’t get discouraged if you don’t see instant results. There are still some positives changes happening in your body, even if they are not immediately apparent. You will flower and thrive, just like an orchid. Enjoyed the lesson. Very poignant! A nice thing to read first thing in the morning after enjoying a tea on the dock at the cottage looking over the crisp blue lake at the brilliant green rolling hills.